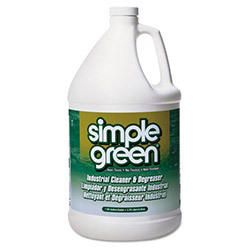 Keep your surroundings clean and free of grime with the Simple Green All-Purpose Industrial Degreaser/Cleaner. This unscented degreaser has a strong, high performance formula that removes oil, lubricants, dirt, and grime from surfaces swiftly and effectively. This cleaner is effective for cleaning fiberglass, plastic, stainless steel and wood surfaces. This heavy-duty industrial degreaser is concentrated and can easily be diluted with water. It can also be used in steam cleaning and pressure watching applications. This safe cleaner is biodegradable, nontoxic, nonabrasive, and non-flammable. This all purpose cleaner degreaser comes in a 1 gallon bottle. ReStockIt.com sells this product individually. The strong, yet safe formula in this all-purpose industrial cleaner is capable of removing oil, lubricants and grime from washable surfaces. The formula can also be diluted for lighter cleaning duties, or it can be used in pressure washing and steam cleaning. If that`s not enough, it`s also great for food preparation surfaces there`s really nothing this cleaner can`t do! Exempt from OSHA and EPA requirements for special handling or personal protection for hazardous materials. For safety and environmentally conscious users. Formula is biodegradable, nontoxic, nonabrasive, nonionic and nonflammable. 1 gal. Degreasing Cleaners from Sunshine Makers / Simple Green! 1246 In Stock today. Simple Green is a mean, green cleaning machine! It gets the toughest stains out and keeps my home smelling fresh everyday! The best part about Simple Green Degreaser/cleanser is that it is a green product and safe around pets. I will be reordering this soon! We use this to clean our boat on the lake, love the way it cleans, is safe for the environment, smells wonderful and does a great job on the mess the spiders make.